FILE Photo- Product shot of Hershey's Kisses and Milk Chocolate bars. Hershey shares surged to a 52-week high Thursday on reports that the chocolate company had received a takeover bid from rival Mondelez International. Hershey's board of directors said Thursday it has unanimously rejected a bid by Mondelez to aquire the chocolate-giant in what would have united two of the world's largest candy-makers. The company said in a statement that it turned down the offer from Mondelez, the maker of Oreo cookies and Cadbury chocolate bars, after determining "that it provided no basis for further discussion between Mondelez and the company." 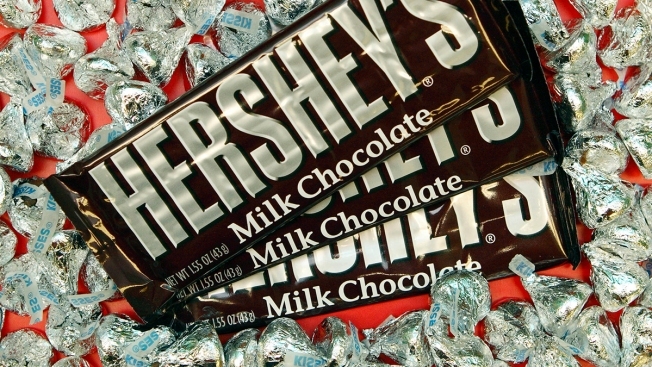 Hershey's stock hit a 52-week high intraday amid reports of the takeover bid. People familiar with the matter say talks between two companies have been on-going. But, any deal would need to be approved by the trust that controls Hershey's through a special class of stock. Although the Hershey Trust only owns 8.4 percent of the company's common stock, it controls 81 percent of its voting power.